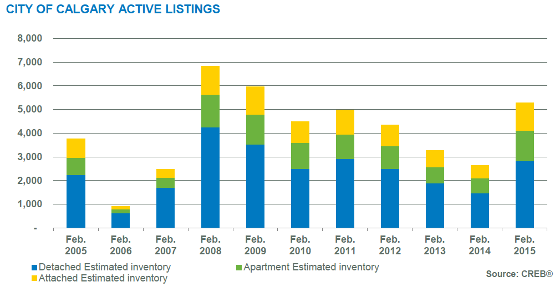 March 2, 2015 – Year-over-year new listings growth eased from 37 percent last month to nine percent in February. However, as sales activity remained below long term averages for the month, Calgary inventory levels rose to 5,474 units in February. 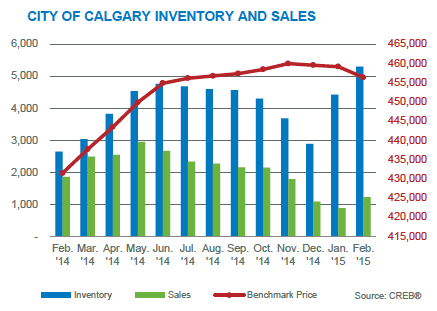 City of Calgary sales totaled 1,217 in February, a 34 percent decline over the previous year’s activity. While sales fell across all product types, the rate of decline was higher in the apartment and attached sectors of the city. Unadjusted detached benchmark prices totaled 516,000 in February, a year-over-year increase of six percent, but a 0.5 percent fall over January figures. The variation in price is more extreme when considering the average price. In February the average price rose by 0.3 percent relative to January, but fell by 4.2 percent compared to last year. This does not come as a surprise given how the composition of the sales influences the change. Benchmark prices provided changes over time on similar properties, providing a clearer indication of pricing trends. If you'd like a full copy of the monthly statistics package, please just let me know by message or email and I'll get it to you right away.